The World Health Organisation estimates that more than 55,000 people die of rabies every year, mostly in Asia and Africa. Rabies is 100 percent fatal, but doctors say that being alert and taking precautions could prevent it. 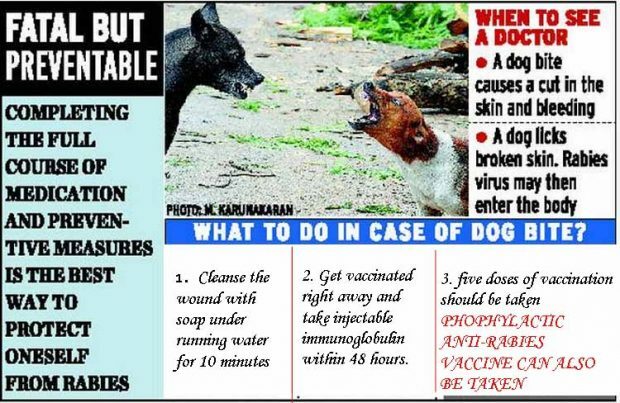 “Whether it is a puppy or dog, if a person has sustained a dog bite, he/she should get vaccinated,” Dr. Naveen K Goel HOD Community Medicine Department, Government Medical College and Hospital sector 32, Chandigarh. Dr. Madhu Gupta, Additional Professor, GMCH 32, said if a dog is stray or has not received regular shots, then anyone bitten by the dog must get rabies vaccination. “In case of a dog bite, people should not apply antiseptic lotion or tie a cloth around the wound as it will cause irritation leading to the rapid spread of the virus,”Dr. Naveen added. Seeking immediate medical help is crucial. “The immunoglobulin should be administered within 48 hours of the bite. It has specific antibodies against the virus and is administered according to the person’s weight,” Dr. Madhu adds. The saliva of the dog has the maximum viral load. If a dog licks intact skin, the virus cannot enter the body. The trouble comes when it licks broken skin or bites the skin causing bleeding, she said. If a person who has taken the prophylactic dose gets bitten, she needs to take a booster shot. The symptoms of rabies are neurological in nature as the virus travels through the nerves. It travels with high speed in nerves and before entering into nerves its speed 2mm/hour in and around the wound. “The person will display altered behaviour and will be extremely agitated. She will develop hydrophobia, a fear of water,” Dr. Madhu said.